Our pint-sized Cosco 5-Piece Kids Table and Chair Set are designed for big fun. In bright, primary colors, they're practical for arts and crafts projects, tea parties and birthdays. Featuring pinch-free chairs, durable construction and easy-to-clean surfaces, they are relatively low maintenance to keep their appearance. 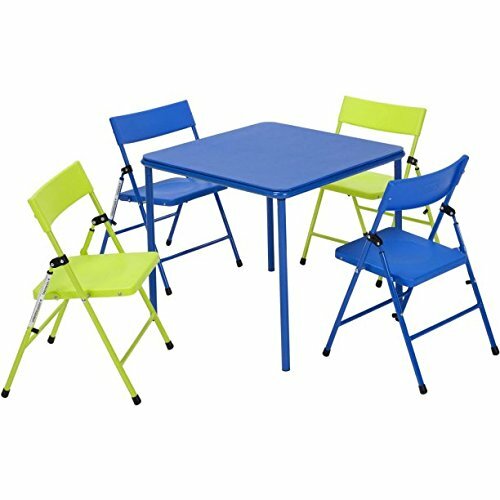 The kids can be comfortable at the 5 piece table and chair set in multiple colors as they are sized just right. Available in two bright color combinations, they are practical furniture pieces for common areas or wherever your children like to set themselves up. If you have any questions about this product by Easy, contact us by completing and submitting the form below. If you are looking for a specif part number, please include it with your message.